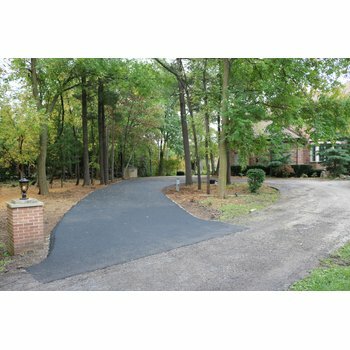 If you’ve ever seen a heated driveway in action, you know exactly how valuable they are. They eliminate the need for snow shoveling or plowing, saving the homeowner time, money and — most importantly — back-breaking labor. Snow-melting systems work by heating the driveway from underneath the surface, ensuring that snow and ice never stick to the pavement. Unlike other heating systems that use plastic tubing, electric heating cable can withstand very high temperatures during the driveway installation, meaning it can be paired with asphalt, concrete and mortar under pavers. These electric snow melting cables can even be retro-fitted into some existing driveways if needed. Snow-melting systems, depending on the controls and sensors selected, can be set to kick on when the sensor detects precipitation of any kind (snow, ice, or rain) and the air temperature reaches a certain degree. 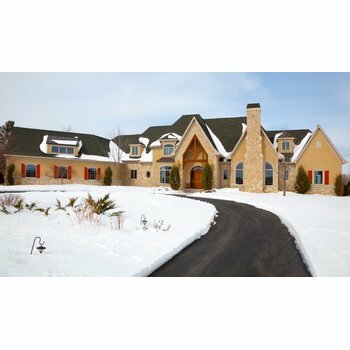 This is the most cost effective way to operate a heated driveway system. When the system is in action, it radiates 50 watts per square foot upward through the driveway to keep the pavement clear and dry. For homeowners, it’s one of the most valuable aspects of their home because it keeps them safe and it’s incredibly convenient. However, there’s one thing many homeowners question before investing in a snow-melting system: How much energy does it use? And, in parallel, how much does it cost to operate? As a part of our free SmartPlan service, every single quote and order from WarmlyYours will be supplied with the operating cost, voltage and amperage needed to run your system. We do recommend that your electrician reviews the electrical plan before the system is installed to ensure that house electrical service has enough capacity to power-up the heating system. However, there is also a relatively simple formula to figure this out for yourself. To find out the operating cost for a snow melting system, you first need to identify the total wattage of the system by multiplying the square footage by 50 watts (which is the wattage per square foot emitted by a WarmlyYours snow-melting system). Then, divide the total wattage by 1,000 to get the kilowattage. Finally, multiply the kilowattage by the average kilowatt per hour (kWh) rate in your area. Locate your latest electric bill to determine your particular kWh rate. For example, let’s take an average 20- by 20-foot driveway. Assuming the homeowner wants full coverage for their radiant heating system, the square footage of the heated area would be 400. Multiply this by 50 watts and you get 20,000 watts. Divide 20,000 by 1,000 to get 20 kilowatts. Then multiply 20 by the national average kWh rate of $0.08, and you wind up with $1.60 per hour. If the snowfall lasts six hours, that snowstorm will end up costing you about $9.60 in operating costs. If you set the same system to run for an additional 3 hours after the snow fall has stopped (a feature we call “after-run time” that helps make sure that the melted snow fully evaporates), then the total operating cost for 9 hours would be $14.40. Much less than hiring a professional plowing service! 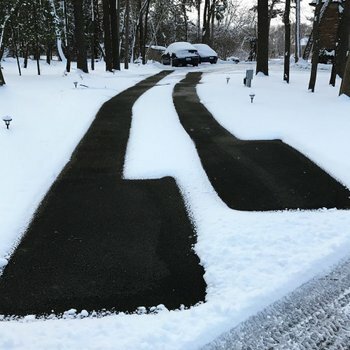 An even more affordable option for heating a driveway is to only heat the tire tracks. A WarmlyYours snow-melting heating mat is 2 feet wide, so if you need two sets of tire tracks for a 20-foot-long driveway with a 2-car garage, you’ll wind up with 160 square feet of heated area. When you apply this number to the formula, you end up with $0.64 per hour. This formula can also be applied to snow-melting systems for walkways and patios. For many homes, nothing’s more treacherous than a walkway to the front door during the wintertime. It’s a prime spot for ice to build up and create a dangerous area for visitors. As a result, it’s a liability and a homeowner’s worst nightmare. To solve this issue, a snow-melting system can be embedded within the concrete or in mortar under pavers. In the example below, a large walkway used two heating cables to cover 110.5 square feet. Using the formula above, it would cost about $0.44 per hour to heat this walkway. 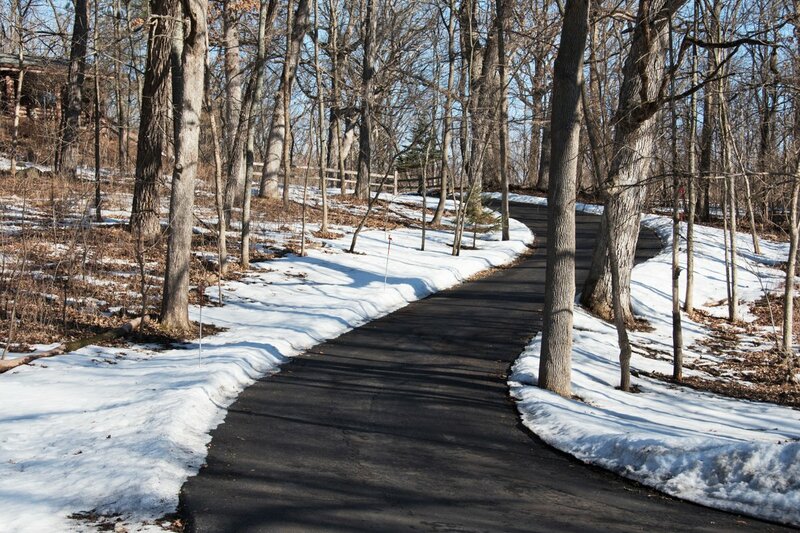 Whether you’re heating a driveway, walkway or patio, a snow-melting system can create a safe, hassle-free outdoor space for any home that’s inexpensive to operate. To find out how much it would cost to operate your very own snow-melting system, use the formula above. If you’re happy with the results, check out WarmlyYours’s free Snow Melting Quote Builder, which will help you choose the right snow-melting mats and cables for your project and see how much they cost. Your snow-free outdoor space is just a few clicks away!